I spent a lovely 4 hrs yesterday with Lyn & Kate (girls from work) as we were entranced by the delightful stage production of My Fair Lady. I absolutely love going to see musical productions and this was certainly one of the best shows I have ever seen. We were seated in the fourth row so had a wonderful view.... the bonus was that two small boys were seated directly in front off us so I didn't have to contend with a tall man's head obscuring the view (this usually is what happens to me). The cast were just wondeful and Reg Livermore certainly made Professor Higgins his own....I hadn't realised how talented he was. The sets were magnificent but the costumes were the ultimate. 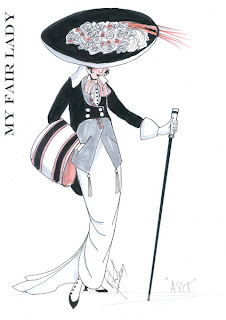 Here is a sketch of one of the fabulous creations from the scene at Ascot. The hats were just incredible and so big. No two costumes were the same. It was such an amazing site to see so many of these wonderful creations all together. Lyn, was so excited and couldn't stop talking about them on the drive home. 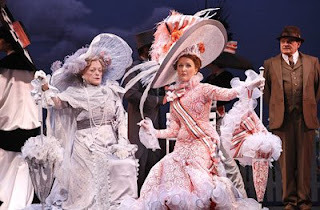 Here's another example of Eliza Doolittle's costume at Ascot. Everything was so well thought out and everything was colour coordinated to perfection. It was a wonderful way to spend the last day of my mini break....back to work today. Eight more weeks of university to go. I haven't been as diligent as I should have so it is going to be heads down until then....may not get much stitching done (but I will certainly try). I have stayed true to my word and have spent the last five days leave from work, stitching my heart out and recharging my batteries. As a result I have quite alot to share. 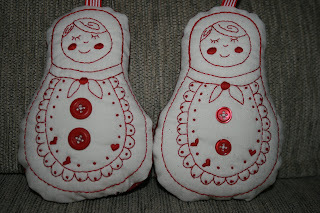 Here are some stitchery matryoshka dolls that I made using a pattern I found on Rachel's (sorry I don't know her last name) blog. She offers this pattern for free and has a link so you can to email her to get it. I just added some of my own detail to make it more my style. 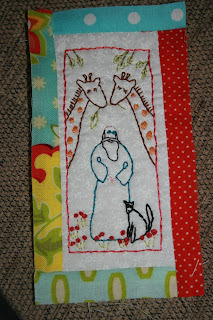 The following photos are of stitcheries I have done using Lynette Anderson-O'Rourke's free Noah's Ark block of the month. Lynette is avery talented and well known international designer and has designed this little stitchery to celebrate a year of blogging. If you click on the Noah's Ark image at the right of my block it will take you to the design and Lynette's photos of the stitchery quilt. She has also put links to others who are making her design and it is really interesting to look at the different colourways and styles everyone has used. I have another three to stitch up and then I will be up-to-date with the blocks. I chose to use bright fabrics in my quilt as am a bit addicted to these colours at the moment. But Lynette has used a more tradtional country colourway. Some ladies have done the stitching in just red or blue threads and some have coloured the images in with pencil. 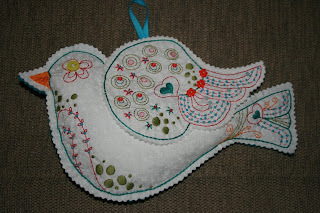 I have also been inspired by the beautiful embellished birds Dot has been making. You can see them on her blog here. I wanted to make it in the style of a stitchery but to also make it a bit dimensional. Therefore I have used beads and buttons. I also padded the bird lightly and sewed the birds wing seperately and used thick interfacing to make it stand up without being floppy. I am really happy with how this has turned out and am now going to make some as christmas gifts for my friends and family in their favourite colours. In a previous post I showed the beginnings of a stitchery quilt I have designed. Well I have now completed one and a half of the stitchery blocks. Here's one of the blocks completed. There will be four blocks in total and I am now looking for the perfect fabric to use as the sashing between the blocks. I want something a little different and quirky so am thinking of a green polka-dot print. 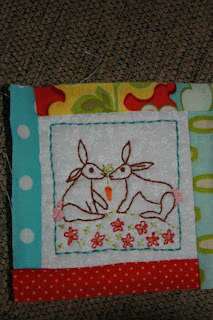 I just spent the day with my friend Jo teaching her how to do redwork stitcheries. She is going to make up one of my original designs as a present for her friend's birthday. And tonight, my friend Milly has just phoned to say she wants to come over and have me teach her to make dotee dolls. 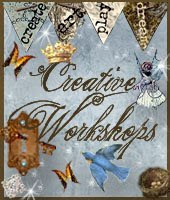 What a wonderful way to spend the whole day and night, being with friends and sharing my love of craft. I love helping others discover their own love of craft. 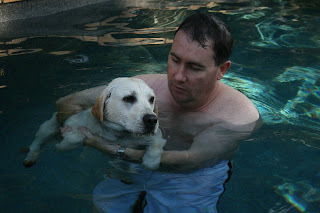 Now I can't end this post without sharing a photo of Lockyer going for his first swim in our pool. At first he was scared and kept going to the side, but after a while he started to enjoy it and we couldn't get him to get out of the pool. Mark will kill me for putting this photo of him on my blog, but it was so cute seeing him teaching Locky to get used to the pool. Mark doesn't have any kids of his own (although he treats mine like they were his own), so this puppy is very much his baby. I love watching the two of them together. Well I better get going. I want to have a shower before Milly arrives and the stitching continues. I mentioned in the previous post that I was taking my dog Benson to the vet. Well the vet wasn't too sure about the lump on his foot, but thought that it is most likely cancer. She thought it might pay to get it cut off and amputate part of his paw.....all for $1000.00. But she also said that if it was cancer it would have spread throughout his whole body by now. As the lump isn't causing him any concern at all and the fact that he is quite old and may not survive the anaesthetic we decided to do nothing for now, but just to watch it. If he was in any pain or wasn't able to walk properly we would do it. I'm off shopping with a friend today. As I have had this week off from work I've had the redecorating bug and have been rearranging all the furniture in the house (much to Mark's annoyance). I bought some vases, candles, lampshades and a new rug yesterday and now want to find something nice to put in the centre of the dining table. I've also been sewing but haven't taken photos yet....I'll do that today and post them later tonight. Last week was my first wedding anniversary. Yes, Mark and I eloped last September to Long Island in the Whitsunday's and got married. We then spent a wonderful10 days on the island and at Airlie Beach. I love it up there, it is just so beautiful. If we could we'd move up there in a heartbeat. Hopefully we'll get to take the kids up there next year. I was very spoilt and received some beautiful roses, a card and a willow tree figurine. Aren't the roses just beautiful? He isn't much of a flower buyer so I was really surprised. This is the beautiful card he gave me. Doesn't it look like a scrapbook layout? On the sewing front, I have been having a lot of fun. I haven't sewn anything that wasn't my own design for a couple of years so have had fun sewing from patterns. I've been getting up early and going into my craft studio before anyone else wakes up and having a lovely time locked away in there by myself. This is a chair caddy I made using a free pattern from Helen from Hugs n' Kisses. She has started a wonderful project called a Stitcher's Angel. It was set up as a swap where prominent designers designed free projects for people to use, you could join as a swap member or just use the available free patterns. The patterns so far have been lovely and include pin cushions, totes and a scissor keeper. You should go and have a look. There is also a link to the flikr group and it is interesting to see everyone's interpretation on the pattern. I would have loved to have been a part of the swap but just didn't have the time. So I made this arm chair caddy using the free pattern, but added my own stitchery to it. I also added a thread catcher to the design that can be removed if needed. 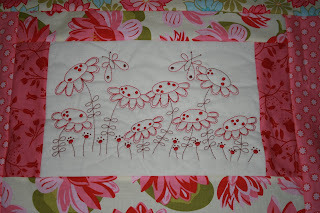 I used some lovely Heather bailey fabric as well as red and aqua polka-dot fabric I had in my stash. I just love it and it is very handy to have all my threads etc at hand while I am stitching. 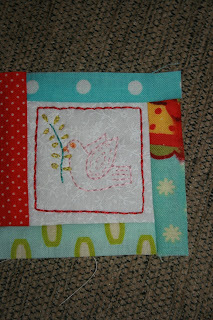 I am also working on a new stitchery quilt design using some very pretty and girly fabrics I bought off etsy. I've been enjoying doing this stitchery. 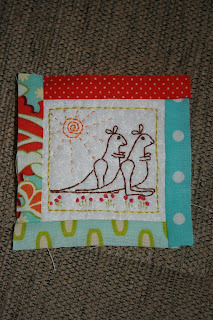 Here it is with the design drawn on one of the blocks just before I started stitching it. I'll post some more photos when I've stitched some more. I have a week off work and although I need to get on top of my uni work (can't believe there is only nine weeks to go). I am planning on catching up with friends, sewing, tidying up around the house and enjoying having time to myself to do whatever I want to do. Mark will be working and the kids have gone to Cairns for a holiday with their Dad, so I will have the house to myself. Yippee!! It will be bliss. Well I have to run and take my dog Benson to the vet. He is a 14 year old shitzu-pomeranian cross who has a rather nasty lump on his back paw. It has been there for a while but has been very small. I just noticed yesterday that it is now the size of an egg and looks very vascular and is starting to spread his toes apart (do dog's have toes?). So I hope it isn't anything too serious. He's a bit of a pain as he has never been a very affectionate dog, barks alot, is deaf and incontinent, but I still love him and wouldn't like anything to happen to him. Well I've finished another few Amika dolls to sell in my etsy shop. I just love making these little dolls. Here's a closeup of the beading detail I did on this little doll. I find it very relaxing....although this time I spilt the whole container of these tiny seed beads on the floor and spent ages picking them all up before the dog ate them. I spent a lovely morning yesterday with all the girls at work at a little patissrie in New Farm. 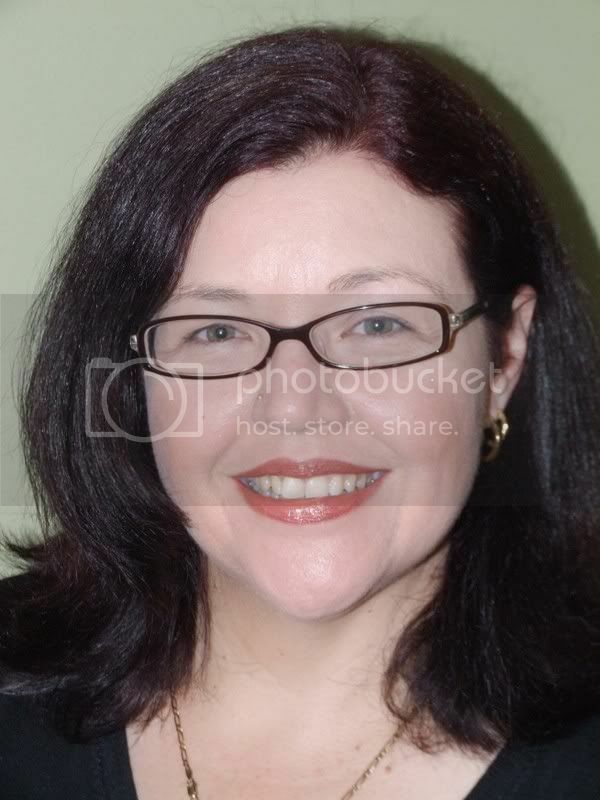 Michelle is one of my co-workers who has successfully fought breast cancer twice. A couple of years ago her fight resulted in her having a mastectomy. She has been saving since then to have breast reconstruction surgery and is scheduled to have the procedure this Thursday. Because she will be off work for a few motnhs we went out to celebrate. I took my camera with me but as I had just finished night shift was a bit scattered and forgot all about it....so don't have any photos. I ordered an italian hot chocolate (I don't drink tea or coffee). I had never had one before so wasn't sure what it would be like, I thought it would be like every oother type of hot chocolate. Well it wasn't. It was a cup of the thickest, yummiest chocolate I had ever eaten....so much for my low carb diet...must have had about a months worth of carbs in it. It was so thick I couldn't drink it. I had to eat it with a spoon. Here is a picture I got of the net so you can see just how thick they are. It was nice to get together with everyone away from the hospital....and we all get on so well. Michelle was very excited to receive the bag, nightie and robe we all had bought her. I also gave her a special pink dotee doll to take to hospital for goodluck. Well I have to run....have uni work I keep putting off to go through. In a previous post I mentioned that I was designing a softie doll based on the Japanese Kokeshi dolls. Well I have finally perfected a version that I am really happy with. I call them Amkia Dolls. Amika is a japanese name which means bright & beautiful, which I believe these dolls to be. I have finally opened up my new etsy shop.....t is for teeyore. See it here. There is only the one doll for sale at the moment but she has 5 sisters almost ready to go on sale, just finishing the embellishing on them. This is the original Amika doll that I made....I'm not selling this one as she has very special importance to me. This is the first one I have for sale in my etsy shop. A girl at work wanted me to make her one in soft girly colours. Not what I would usually do but I think she turned out quite pretty. Here is the first batch of these little ladies, waiting to be sewn together and stuffed. Don't they all look yummy together? And here they are waiting for the finishing touches....beads, buttons, trim & ribbons. This is the best part of making these little dolls. It is so relaxing sewing on the beads and other details. I also finished another Ruby Doll. I love these little dolls. I made this special round dotee doll as a surprise for a very special person. I really hope she likes it. I loved the brown & pinks on this fabric. While I was sewing in my studio I looked up and saw all these pretty dolls.....and thought what a lovely view. Here is a photo Kiara took of Lockyer. Not really immpressed that she put him in my bed..... but he does look cute doesn't he? Well that's about it for this blog post. I have some more dolls waiting to be embellished. 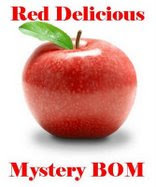 Hello and welcome to my blog. 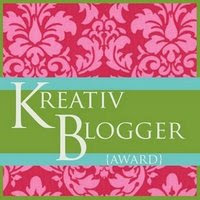 As well as being a craft addict, I work fulltime, have two very active children, and a husband who I adore. In my 'spare' time I enjoy designing, crafting, selling some stuff and making stuff for family & friends. 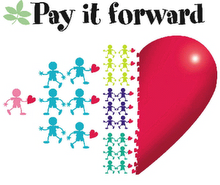 Want to Find a Swap?